Taxi service is very good and not a problem. You do not need to be fearful for your safety. The cost for food is ridiculously low. The food is delicious but if you want to pretend you are back home, you can probably order food just like mom cooks. If you suffer from celiac disease this is the perfect place for you. Food can be very salty so ask for no salt if you need to. Travel with hand cleaner even though the accommodations are very clean. Drink lots of water before and after the plane flight. Carry small packs of kleenex...and do not put toilet paper or kleenex in the toilet. Always bargain with the people on the street and remember that store owners have a set price. Offer half what they ask but you will pay 1/3 less usually. If you cannot afford the price just walk away but remember that if you touch an item or look closely, the vendor will think you are going to buy. Expect to be beckoned in to the stall...get over the fact that you are not used to the practice. You are not in Kansas anymore! 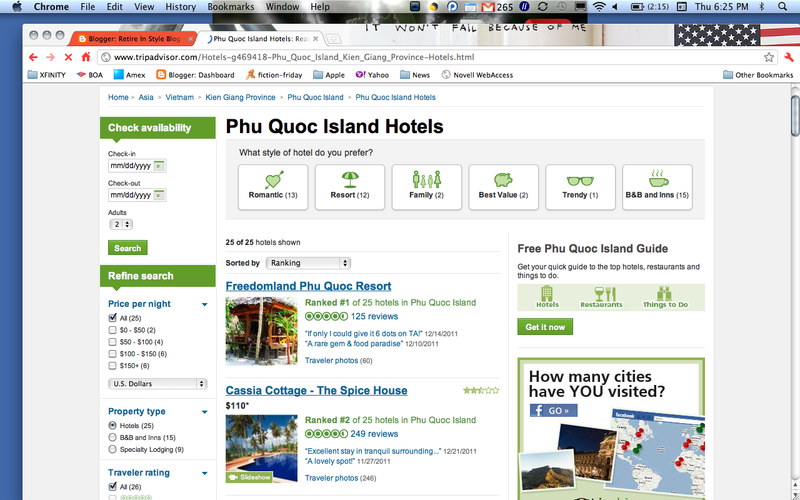 We are on Pho Quoc, an island off the coast of Vietnam and Cambodia. We are staying in a resort called Cassia Cottages on a beach lined with other small resorts. We did not make arrangements for this vacation so I wondered about the process of making our stay in Vietnam happen. How do you find the perfect resort? I asked my daughter-in-law. She then told me about the website she used for this particular trip called Trip Adviser. 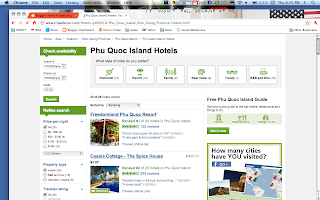 She used this website for the hotels in Hanoi, Sapa and Phu Quoc. The hotels are ranked by people that have stayed in them so finding something that meets your requirements is just not that hard. When you read the comments related to the resort you think might interest you, they are separated by family, couples or business. This will give you a very clear vision of how people like you see the resort. For example in Hanoi we stayed in Hanoi Gecko with bigger rooms so that we could put three beds in the rooms that needed them. The owner actually went out and borrowed what he did not have. In Sapa we stayed in Sapa Rooms but arrangements for our train trip was made through Six on Sixteen, a Sapa Rooms sister hotel in Hanoi. We stored extra luggage their when we traveled to Sapa and they opened the hotel early so we could wait in comfort for our plane flight out to Ho Chi Min City. The small hotels and resorts are run in a very personal way. The Six on Sixteen in Hanoi and Sapa Rooms are owned and run by an anthropologist/business man. Amanda contacted him daily for a long time. The personal care we received from him was amazing. He is in the business of running hotels that give back to the Hmong people living in the Sapa region. On Christmas day he will host a dinner for locals people and the guests in the hotel will wait tables and contribute to the meals. We flew Vietnam Airlines directly from Shanghai, then from Hanoi to Ho Chi Min City and added a short hop over to the island. Service was okay in all the cases. I would advise you to eat before boarding the planes. The food is marginal at best! Really, looking inside the sandwich at the gray meat will give you a subject for conversation for quite a while. More tomorrow. The ocean is calling my name! Very nice! And timely for me as well. 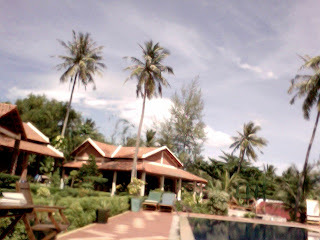 We'll be traveling to Southeast Asia in spring of 2013, so I'm enjoying your blog very much.